-Colin McCarthy, Contracts Paralegal, Sonos, Inc.
ContractWorks is for companies that are looking to move away from managing contracts manually, tracking details using spreadsheets, or are struggling with an existing contract management process that's too complicated or too expensive. With a digitized system that makes finding specific contracts quick and easy, and an advanced tag-based search to find contracts based on data points that you have identified as important, this customizable software allows for your business to work on its own terms. We know that your corporate contracts are the life-line of your business, containing valuable information that cannot be compromised. 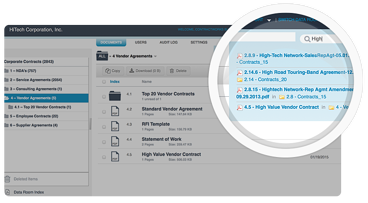 That's why we've built our contract management software on top of the SecureDocs Virtual Data Room's industry-leading secure platform. With privacy and security top of mind businesses can securely store and share all of their critical documentation with strict access control and user activity tracking. As with all SecureDocs, Inc. product ContractWorks has publicly available pricing plans with no hidden fees, offers quick set-up, is easy to use, and although not usually needed we have a 24/7 support team to assist you with any questions you may have. Visit ContractWorks.com to learn more.